Wow, those must be rare. I could never understand how it made any business sense for a company to spend time and money on proprietary add-on interfaces that had no hope of catching on. Like the AMR\CMR slots and AGP Pro. Yes they do. At least in Poland. Bottle of stronger alcohol or six pack of beer for a favour or a bunch of things that are useless to the other person. I was given Amstrad 6128 with GT65 monochrome monitor and paid back with four bottles of wine, as the colleague from work would not accept money, but I know he likes wine. I haven't tested it yet, but plan to build a system around this. Not sure on the CPU yet. Need to check what CPU's the motherboard supports. Maybe a K6 or Cyrix/IBM/ST PR200? Ozzuneoj wrote: I could never understand how it made any business sense for a company to spend time and money on proprietary add-on interfaces that had no hope of catching on. Like the AMR\CMR slots and AGP Pro. Fully agreed on proprietary interfaces, but none of those you mention are proprietary. AGP Pro was an extension to the AGP standard to deliver more power to the card than a regular AGP slot. Not relevant for consumer cards in those days, but some of the big 3DLabs or HP monsters really needed it. Before AGP Pro they frequently used AGP + a PCI slot, the latter purely for power supply. Volumes weren't high, but the standard made sense in its niche and was used. The exact opposite was true of the AMR/CNR/ACR. 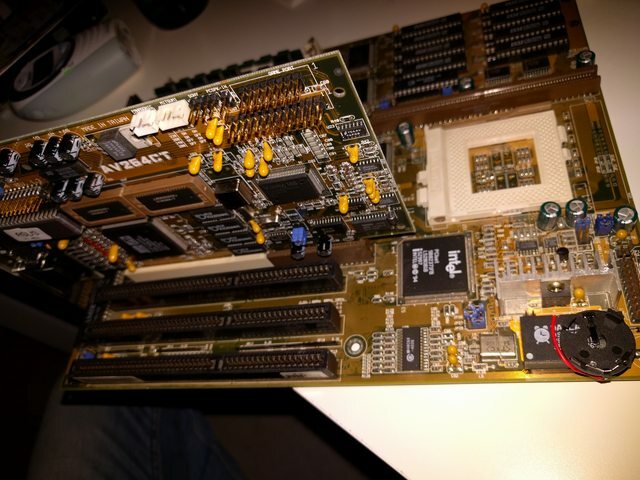 They were for extremely high volume applications where a couple of cents per unit could make a difference, and wasting the cost of a full PCI slot and PCI card for something that didn't need 2/3 of the PCB or for that matter electronics of a PCI card was pointless. Don't forget enthousiasts self-building PCs have always been a small minority. For every one self-built PC there are 100 Packard Bells, Compaqs and Dells & co sold. In 1999-2002 every computer was sold with a modem, and all mainstream chipsets supported AC'97. The reason for a riser card in the first place and not just integrating on motherboard was FCC regulations - devices with analog communication components needed expensive and - worse - time consuming FCC certification before use. Having them on a separate card meant you only needed to certify that card and not the rest, reducing cost overhead and time to market. Altogether there were probably more AMR and CNR modems (primarily manufactured by Askey and Aztech) shipped than all ISA and PCI modems added together - which is why you keep bumping into them in thrift shops these days. The only inexplicable bit was how Intel completely missed Ethernet in their original AMR standard but then corrected it with the not backwards compatible CNR standard a year later. Because that left vendors with unusable AMR stock pretty much everyone else decided on ACR, which was backwards-compatible with AMR and offered CNR functionally. Oh, and used a regular PCI slot mounted backwards, which negated the cost advantage on the motherboard. It was a silly time and mainly Intel's fault. Nonetheless, the only reason AMR/CNR/ACR disappeared is because analog modems disappeared, not because of any inherent issues with the slots themselves. New Voodoo 2000 in factory condition, as is hard these days to find them in that good state, and not broken (at least for about not much money). For the SCSI card variants, they allow you to boot from a SCSI hard disk even if IDE drives are present. Usually IDE drives take precedence over SCSI drives, and you can't boot from a SCSI drive even if your SCSI controller has a boot ROM when a IDE drive is present. - Seagate HDD type 1 with IBM front plate. yawetaG wrote: For the SCSI card variants, they allow you to boot from a SCSI hard disk even if IDE drives are present. Usually IDE drives take precedence over SCSI drives, and you can't boot from a SCSI drive even if your SCSI controller has a boot ROM when a IDE drive is present. I don't think it's because of the mediabus. Even cheap socket 7 mobos had the SCSI boot option in their BIOS and would work with IDE. How the hell does this just show up in a thrift shop?! Was it just lying on a shelf or boxed or what? HP Model 110 Portable. 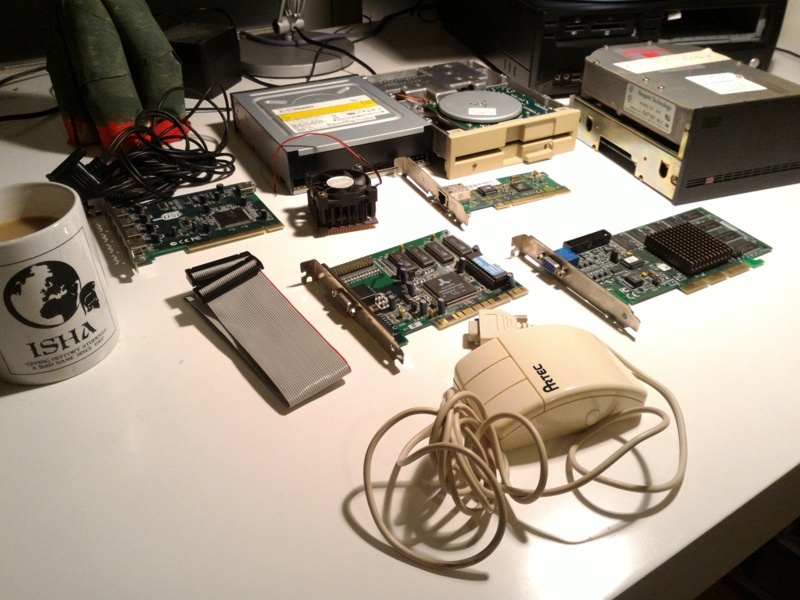 5.33MHz 8086, 256kB RAM, DOS, Lotus 123 & other software in ROM. REALLY nice shape too. The computer & floppy drive BOTH have battery packs still installed. Unfortunately I didn't get the power cables (2-prong square connector, probably 110VAC but not sure yet) or the proprietary HP-IL serial cable that connects them up. Ton of original docs also included. All of this is in excellent condition aside from a tiny bit of "old book smell." Oldschool HP docs. Unbelievably comprehensive. It came with a schematic of the main ROM menu drawn on a beer mat. Even got the original carry bag. Was a bit dusty but cleaned up really well. Managed to grab these two processors for a symbollic price. Sadly, I have no motherboard to test them with. The pins look good though,so perhaps they would work. I'm letting that one sprout so that I can plant them again this year. Because they have no idea what they are selling. They might have had the motherboard too but probably dumped it. The only person there with any clue was an autistic kid who wanted tips how to make his Intel AL440LX system more authentic. Three weeks ago I tried to explain why he should try to sell the Seagate/IBM HDD online. He said he tried but no one was interested. No idea what he did but I couldn't find it. So no surprise he didn't know what the NX586 was or what he could do with it. But today just got (even) better - just got word that I won an auction for a Microsoft Trackball Explorer for a very low sum. Not entirely retro as I use one actively on my regular quad core i7 desktop (and have a second for spares), but given age and unobtainability worth bragging about here. Given the proceeds will go to a cancer charity (it's from someone's legacy) I'll double the selling price, but even then it's still far below regular prices. Last edited by dionb on 2018-2-11 @ 12:06, edited 1 time in total. I have the same media bus card with the ATI chipset, I kinda want to use it in my Pentium pro but the 2meg maximum video ram is off putting. Yeah, but they need a special Asus-made SCSI card to be able to use the option, AFAIK (the boards have a integrated SCSI BIOS boot ROM, and the Asus card is just a dumb expansion card that won't work on non-Asus boards...).